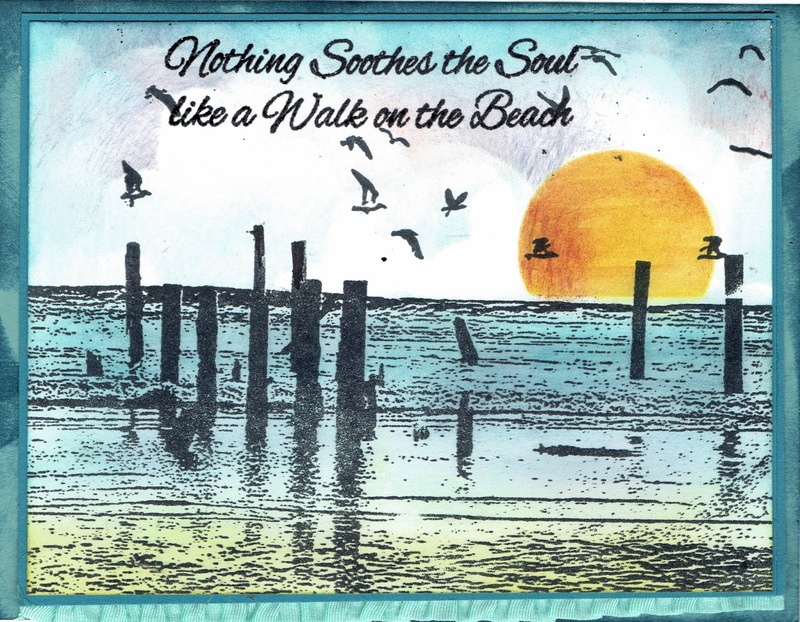 I used the Stampin' Up set called Waterfront to create this scenic card. I colored the stamps with both ink pads and markers. The sky was sponged. I used a fine-tipped marker to highlight the tops of the mountains. Tiny wisps of grass are the grass stamp from Art Impressions. 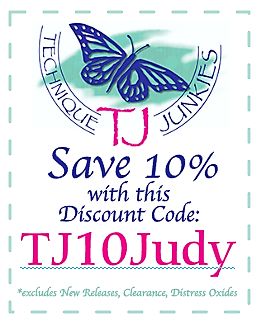 Remember than you can save 10% off your order at the Technique Junkies web store when you use the code TJ10Judy at checkout! Have a wonderful day and get inky! 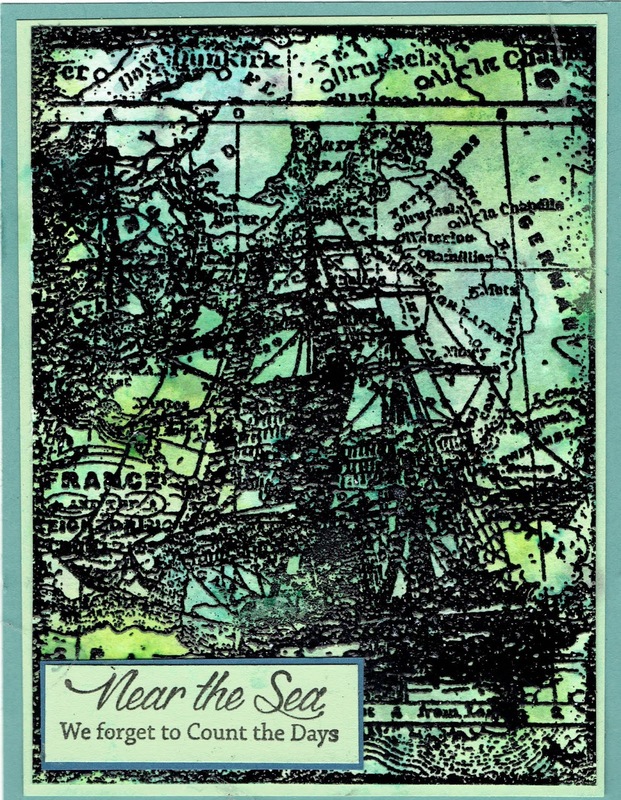 Labels: Art Impressions, Stampin' Up! This is another masking technique card. I created masks of all three of the Technique Junkies sea shells in the set Sea Shells. I used the masks to create the images above and behind other shells. 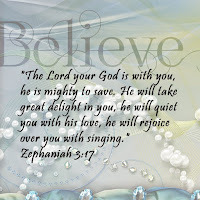 The verse is heat embossed on brown vellum and adhered with adhesive from my Xyron machine. I sponged a pale yellow ink for the sand in between the shells. Blue ink was applied to the edge direct to paper using the ink pad. A 10% discount can be yours if you use the discount code TJ10Judy when you check out with your order. Have a great day -- and may you have some inky time today! Shaker Cards can be intimidating. You need to use the right stamps to create a scene and for inside the shaker itself. I felt these choices just work for this card! 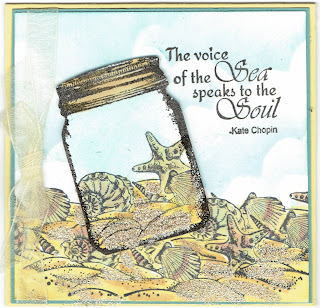 I used these Technique Junkies stamps: By the Sea and Seagrass. 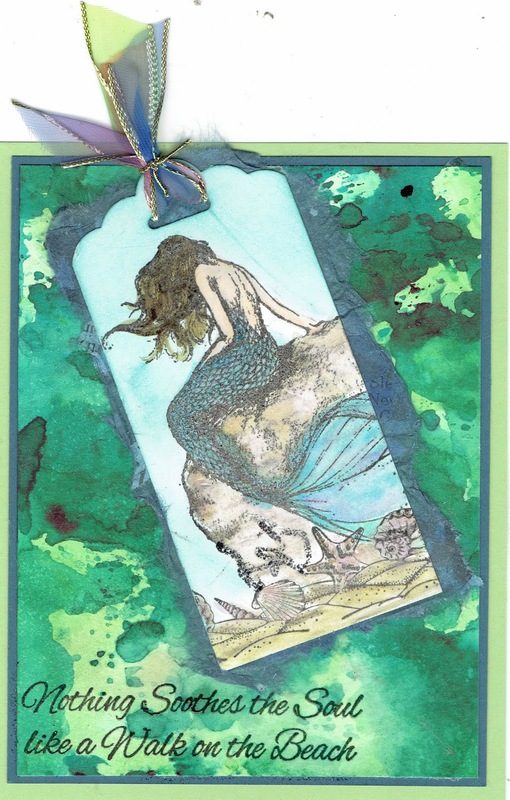 I used a stencil from A Colorful Life stencils with Art Anthology Colorations sprays. Clear acetate from packaging creates the window and a couple of varieties of beads and glittery stuff were used for the "shaker" elements. A 10% discount can be yours if you use the discount code TJ10Judy at the Technique Junkies web store when you check out with your order. Hope your day is just grand, and get inky! 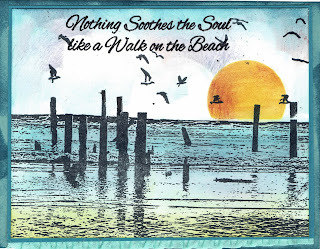 I used Colorburst powders to create this background for this detailed stamp. I had to blot off some of the intense color. 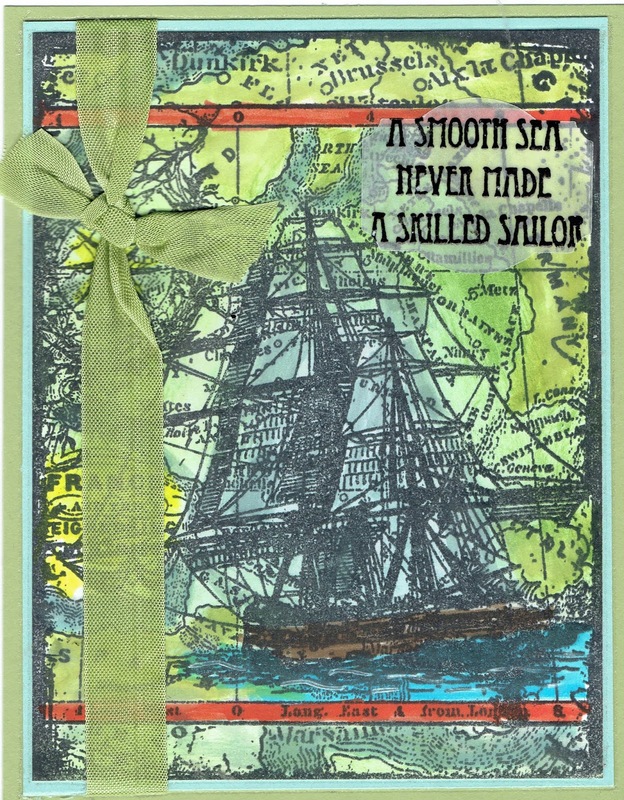 The Technique Junkies Sailing Ship Collage stamp was heat embossed with detail black embossing powder. The verse is from the Technique Junkies set By the Sea. It was also heat embossed. I used a Nuvo Glitter Gloss Aqua Pen to highlight the ship. It has a delicious glimmer! Please remember that you can get a 10% discount at the Technique Junkies web store by using the code TJ10Judy when you check out. Have a terrific day, and be sure to get inky!! I used three different Technique Junkies stamps sets to create this card. 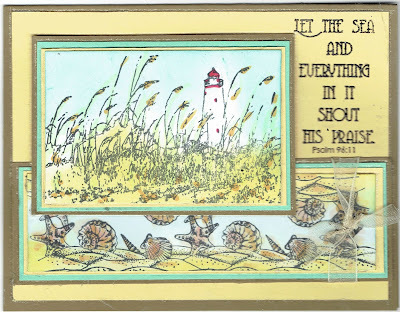 I used Seagrass Lighthouse, Seashell Borders, and Psalms of the Sea. I used Copic markers to color in the images. The verse is heat embossed. You can get a 10% discount on anything from the Technique Junkies Web store by using the code TJ10Judy. Please remember to use the discount code TJ10Judy to get 10% off of your order! What a good deal! I hope your day is sunny and fun! And that you have a chance to get inky! 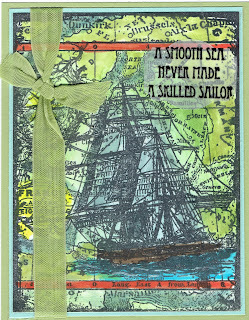 Two Technique Junkies stamp sets were used on the card: Sailing Ship Collage and By the Sea. 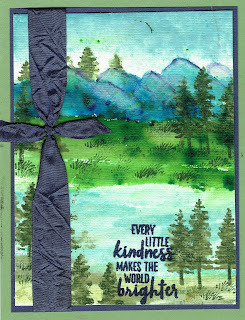 The image was watercolored, and then highlighted with the Nuvo Glitter Gloss Aqua Pens. Please use the discount code TJ10Judy to get a 10% discount off of anything on the Technique Junkies website. Have a great day --- and get inky today! I used a panel of watercolor paper with a torn edge to create this card. To add color to the watercolor paper I used Colorburst. I added water to the watercolor paper and and then added a bit of the Colorburst powders here and there. Then I spritzed the watercolor paper again with water and tilted it back and forth, getting the water and the Colorburst powders around. Then, because it was so intense in color depth, I blotted the paper with paper towels, and then dried with a heat tool. All of the Technique Junkies stamps were heat embossed with black detail embossing powder. 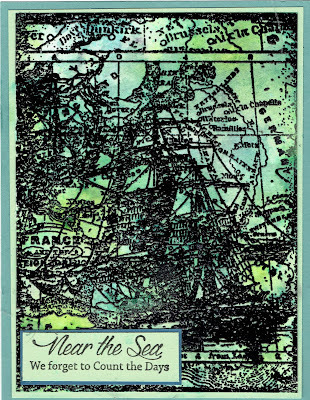 I used four TJ stamp sets: Kissing the Shoreline, By the Sea, Seagrass, and Seashell borders. 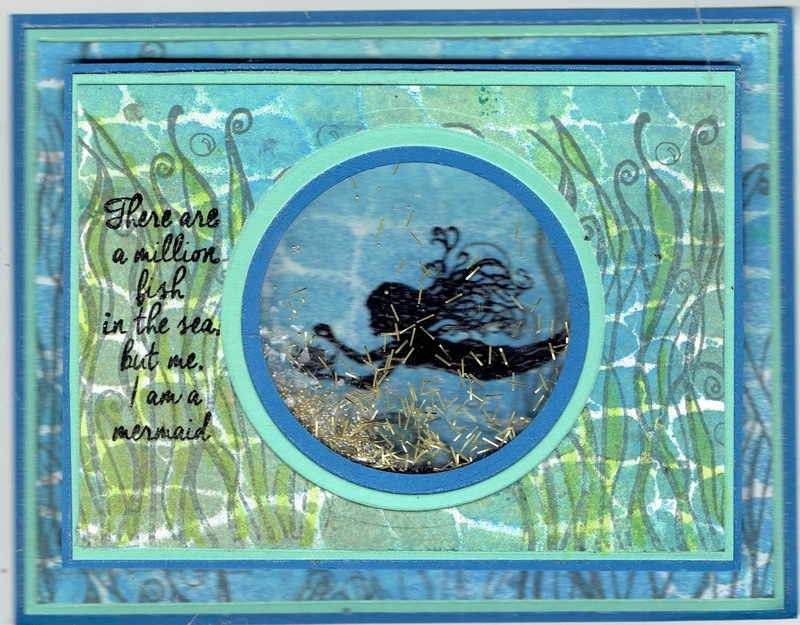 The bubbles, seagrass, and the sea shells were all painted with the Nuvo Glitter Gloss Aqua Pens. You can receive a 10% discount on everything in the TJ Web store by using the code TJ10Judy. Have a marvelous day -- and get inky!! I used two Technique Junkies stamps for this card: Seashells and Sudsy Stuff. I stamped the Sudsy Stuff with a pale aqua ink and added a few Nuvo drops here and there. 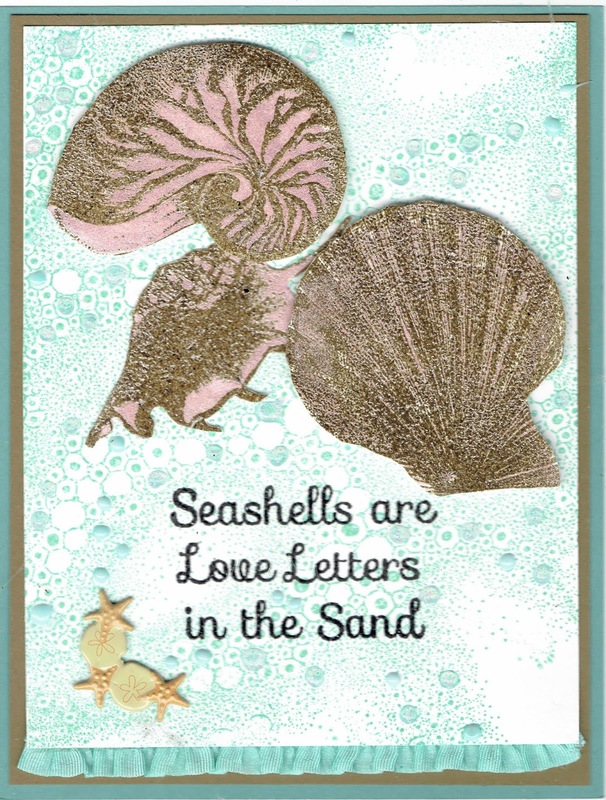 I stamped the shells in a light brown pigment ink and heat embossed the shells with clear embossing powder. The shells were fussy cut, and then painted with ink and water from Nuvo Glitter Markers. It gives a beautiful shimmery pink color to the shells. The verse was heat embossed. Today and tomorrow are the last two days to get 15% off of all of the TJ July Releases. And as always you can get 10% of anything not on sale by using the code TJ10Judy! Have a wonderful sunny day and get inky! The only stamp I used on this card was Octopus Face. Because I had previously cut apart the octopus from the verse, it made it easier to create this card. I masked the octopuses with two masks, and randomly stamped the entire card front with octopuses. I added some beige ink here and there on various octopuses. I chose one octopus to completely color in with Copic markers. The ocean was sponged with blue ink. Did you know that octopuses are very interesting creatures? They have no bones and can squeeze into and through extremely small spaces. And they can change their color at will in order to blend in with their surroundings. And if you come across a bright red octopus -- beware! That octopus is angry! When an octopus releases a cloud of ink, it is because they are trying to hide or to escape. Momma Octopus lays a lot of eggs. She strokes and cares for them before they hatch into a gillion teeny tiny octopuses that sort of float through the ocean. Then Momma dies. The baby octopuses are so tiny, most of them are eaten by fish in the ocean. Right now through July 8, you can get 15% off of every July Release stamp. And you can get 10% off of everything else on the TJ website by using the code TJ10Judy. Have a wonderful day, and get some inky stamping done! 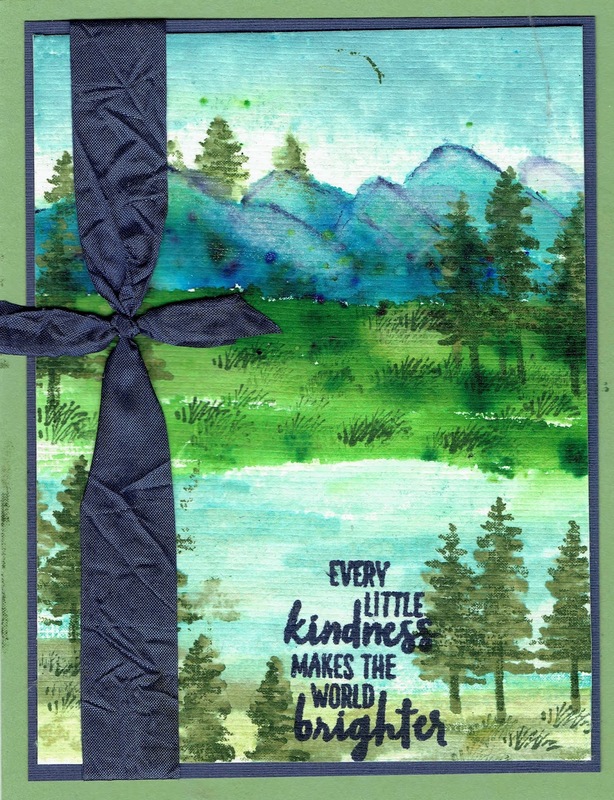 I used three different Technique Junkies Stamps to create this lovely card. 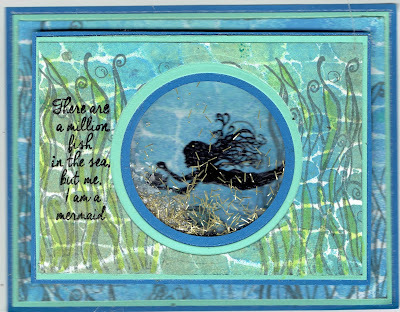 I used Seahorses, Seashell Borders, and Incrediball Canning Jar. 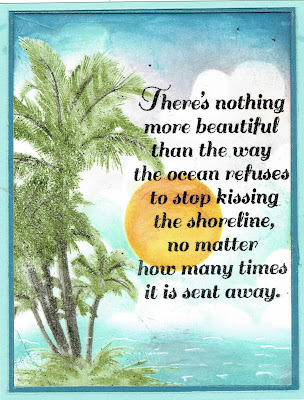 I stamped the first row of the seashell border, and then used a mask to stamp more borders to create a beach filled with shells. To create shells in the jar, I stamped a border row of shells, and then the jar over the shells. The sky was sponged with blue and a cloud stencil. I sponged blue inside the jar. And then I cut out the jar. Everything was colored with colored with my Copic markers. I used a Versamark marker and added ink here and there. The ink was covered with some sand colored embossing powder. That added some texture to the card. A pale yellow ribbon was added to the side. Last, the verse was stamped with Memento ink. Please remember that all of the new stamps are on sale 15% off without a coupon through July 8. And you can use the coupon TJ10Judy for 10% off of everything else in the Technique Junkies web store. Have a great day and get inky!! Happy July! Happy for New Stamps!! It is July and time for new stamps! This months selections are more than nice, they are very nice! Please be sure to look at all of the blogs in our blog hop! And please remember that all of the new stamps are on sale 15% off without a coupon through July 8. And you can use the coupon TJ10Judy for 10% off of everything else in the Technique Junkies web store. The Blog Hop starts here. You should have come to me from Ro Donner's blog. Of course all of my stamps for this blog hop are Technique Junkie stamps. 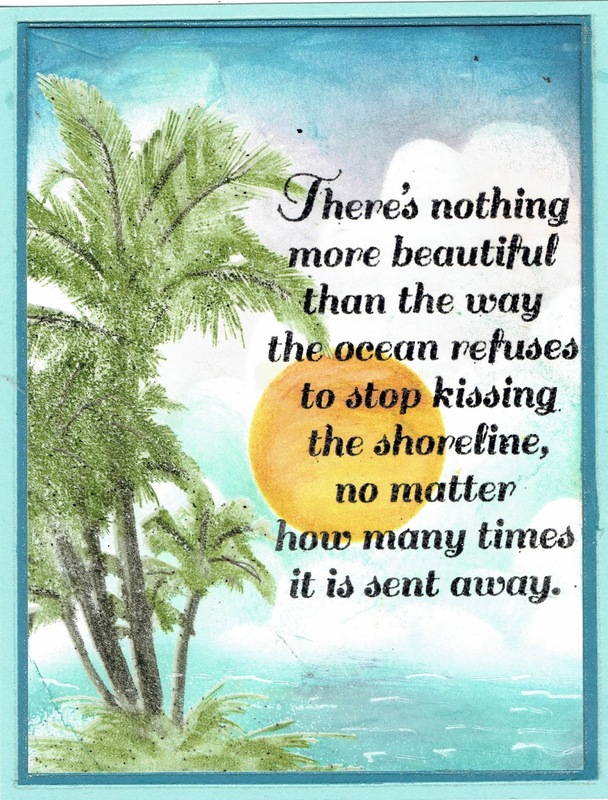 For this first card I used Palm Trees and Kisses the Shoreline. I used the MISTI to stamp the palm trees. I used markers to add color to the stamp, and kept stamping different areas over and over until the image was fully inked. Then I cleaned the stamp well and added Versamark ink several times and then covered the palm trees with clear embossing powder and heat set it. Then I sponged ink for the ocean, and the sky. I used a mask to ink the sun, and covered the sun with a mask to create the sky. Finally the verse was stamped over the sky and heat embossed. 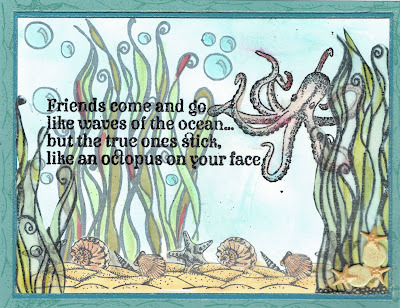 For my second card I used Octopus Face, Seagrass, and Seashell borders. I stamped the seashell border first. Then I stamped a mask of the border. 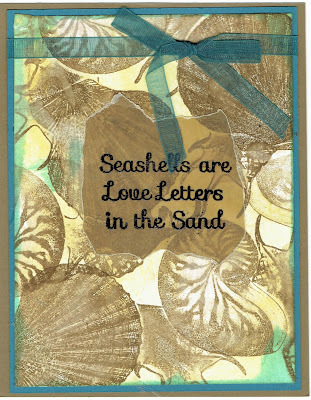 Then I stamped the sea grass over the seashell border. 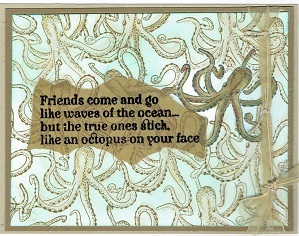 Then I cut the octopus and the verse apart so they could be used separately. The octopus and the seagrass were stamped with Momento ink and everything (except the octopus) was colored with Copic markers. The Octopus was painted with Twinkling H2Os. 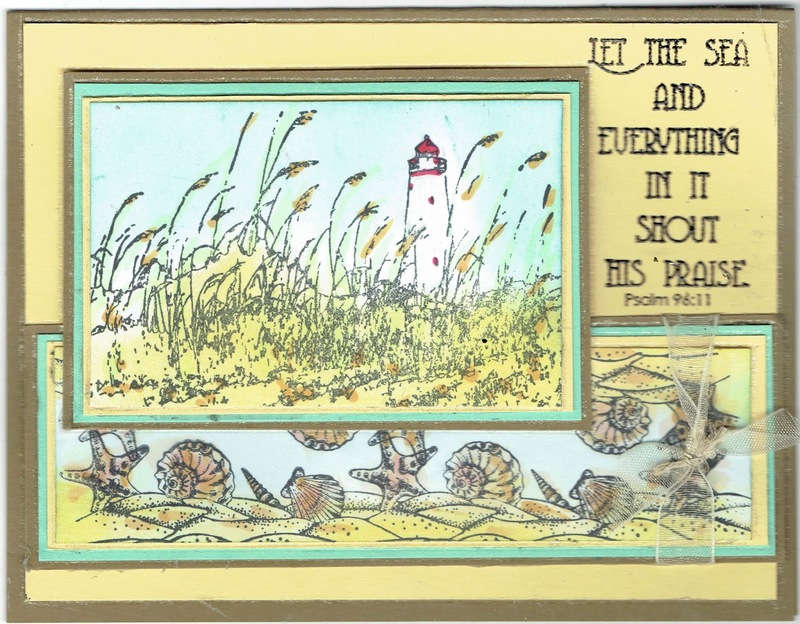 I stamped a second image of the seagrass on transparent vellum. After coloring the seagrass with Copic markers, I ran it through my Xyron machine. Then I cut out the image and cut it into 2 pieces. Then the vellum pieces were adhered to the two sides of the card. Doing this creates an illusion of depth. 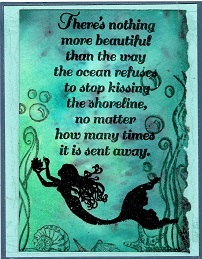 For my third and last card, I used an older but beautiful stamp called Old Pier, and the verse is from Sea Shells. The beach, ocean, and sky were all sponged. The sun was masked. The next stop on our blog hop is with the gifted Beth Norman! Now hop on your way! Have a wonderful day and I hope you find some time to get inky! !